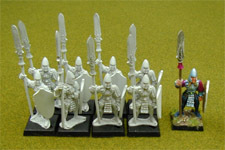 All figures with integral bases, whether they are foot figures or mounted, can easily be affixed to suitably sized plastic slotted bases if required. Simply affix the figure on to the plastic base using a strong adhesive. 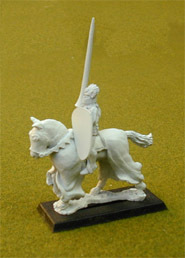 When set, use a suitable modelling putty, such as 'Milliput' to blend the contours of the flat base of the metal figure into the top of the plastic base. Sand and/or grit can be used to add more texture to the 'ground' before painting and flocking as required to produce the desired visual effect.